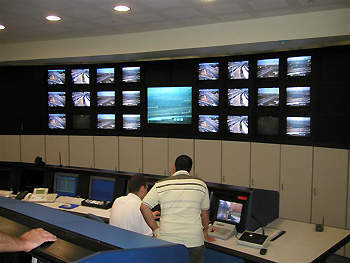 Control room at the Highway Operations and Maintenance Centre (HOMC). Kesem Interchange: upon completion the highway will have in total 14 interchanges. Nachshonim Interchange: the section from Nesharim to Eyal (43km) will channel traffic from the Nachshonim interchange through a route that bypasses Gush Dan. 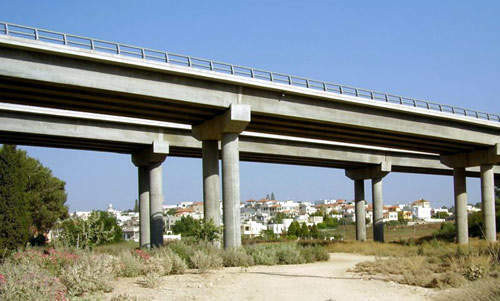 The Cross-Israel Highway has a total of 14 interchanges, 94 bridges and 50 aqueducts. A number of sections of Highway 6 are still currently under planning or construction. An electronic tolling system on Highway 6 is managed from a control centre. Highway 6, or the Cross-Israel Highway, is a 193km highway (including the 76km of the southern extensions) along the eastern part of Israel from south of Beer sheva to the Galilee in the north. 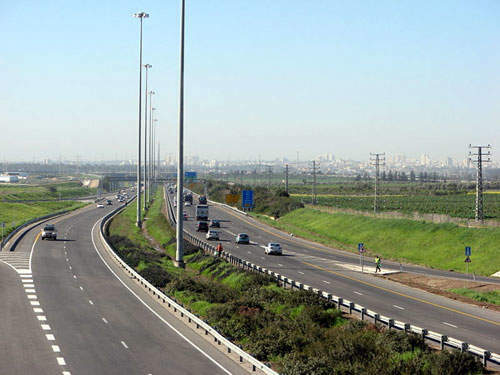 The central section of the road, which is a length of 86km (from Hadera to Gedera) was constructed by Derech Eretz Group and includes a fully electronic free flow tolling system. This section, named after Yitzhak Rabin, was completed by May 2004. On 4 August 2002, the first part of this section was opened. As of March 2008 sections of the highway are still under planning or construction. These sections include the road before Beit Kama at the Highway 40 interchange (under construction), the section after the Sorek interchange (planning), the section just before the Givat Koah interchange (planning), and the section after the Iron interchange (under construction). Road 6 constitutes a primary traffic passage from the central region to both the north and south and is an alternative route to the existing roads, Road 4 (Geha Road) and Road 2 (the Coastal Road). the country in order to reduce vehicle density and pollution in the greater Tel Aviv region. It includes one of the first fully integrated traffic management systems. Highway 6 is the largest infrastructure project in the history of the State of Israel, and has cost $1.3bn. The Derech Eretz group was contracted under a 30-year build operate transfer (BOT) arrangement to construct the road and oversee the operation of the highway. It has three shareholders: Africa-Israel, CHIC- Canadian Highways and Housing and Construction Limited. Arup were consulted regarding the electronic free flow tolling system. This system is largely founded on the system currently operating on Highway 407 in Canada (Arup also had an advisory role with this system). The electronic toll system designed for Road 6 is without entry and exit barriers. This system automatically collects the toll via the choice of two methods. The second method is achieved through the photographing of licence number plates by means of the electronic system. The account is sent to the owner of the vehicle or can be paid by way of credit card or direct debit from a bank account. License plates not in the database are charged via the Israeli Ministry of Transport at the full tariff, which is 80% higher than the PASSKAL rate. cameras and laser equipment for the purpose of characterising the type of vehicle was also installed at the toll gates. The minimum payment of NIS15.6 (new Israeli Shekels) is for three sections (up to 25km). The maximum payment of approximately NIS20.84 is for five or more sections (covering all 15 sections). There are over 500,000 registered subscribers and over 21 million journeys per year; 80% of traffic is by subscribers. Profits from the toll have been increasing every year since 2004, with a total increase so far of 137%. 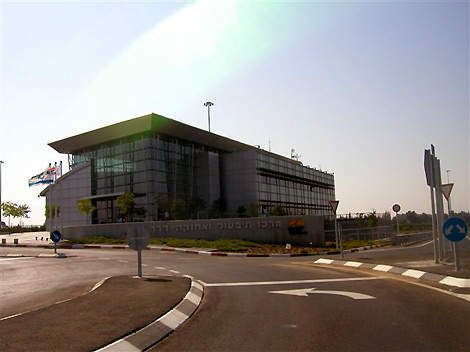 central operations and control centre at the Nachshonim interchange. The project involves 1,700 direct and approximately 10,000 indirect employees. 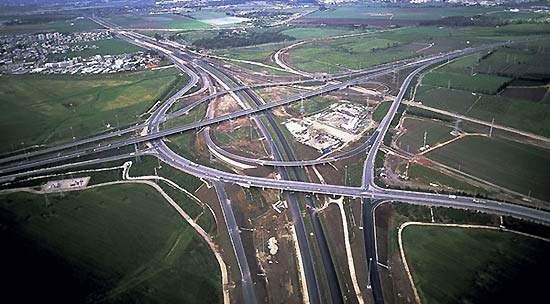 On August 4 2002 the first section of the highway from Kibbutz Eyal to Nachshonim interchange (17km) was completed. 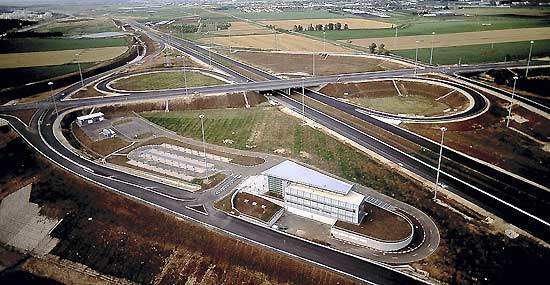 Additionally, in 2002 the Ben Shemen interchange and the stretch from Ben Shemem to Eyal (35km) opened. This route shortens the travel between Jerusalem and north and bypasses Gush Dan, channelling traffic east and thus reducing traffic congestion in the central cities. The section from Nesharim to Eyal (43km) channels traffic from the Ramle region (Nachshonim interchange) through a route that bypasses Gush Dan, including free flow of traffic from Jerusalem up to Eyal, via the Ben Shemen interchange. The Eyal to Soreq (59km) section enables southern traffic and traffic from the port of Ashdod to bypass the constant traffic jam on the Coastal Road leading to Tel Aviv. This section opened in 2003. The design and laying of Road 6 took into account the preservation of the environment and archaeological sites. Investing $70m, Derech Eretz has set advanced criteria in managing environmental awareness and landscape development along Road 6. The two tunnels nearby Moshav Hadid and Ben Shemen interchange were constructed beneath Tel Hadid, an archeological site; the tunnels were excavated to preserve and prevent damage to the site.